Jonathan Ernst/ReutersGM CEO Mary Barra worked her way to the top over three decades. There have been roughlyonezillionarticlesabouthowmillennials are the job-hoppinggeneration. According to new research published in the Harvard Business Review, that may be a career-sabotaging trend. At least if any of them want to become big-time CEOs. Taking from a sample of Fortune 500 CEOs, management consultants Sarah Dillard and Vanessa Lipschitz found that both men and women rise to leadership positions by staying committed to one organisation. This reveals a commonality — long-term loyalty is the way to climb the ladder. It also reveals a discrepancy. You may be better off working your way up through one company, the way that General Motors CEO Mary Barra did. Now 52, she joined the company as a college intern some 34 years ago, before becoming an engineering manager and later running an assembly plant. That consistency helped Barra break through the glass ceiling. 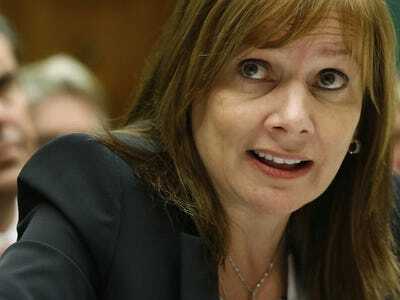 When she took over last December, Barra became the first female CEO of a US automaker.